Discussion in 'Ad Campaigns' started by Benn98, Jan 20, 2019. I love this new bottle. Natalie is stunning, as always. She looks like she not wearing barely any make-up, but Im assuming that is the goal. The outfit is nice too. She's such a classic beauty that this wouldn't look out of place as an ad from the 80s, when campaigns featured perfect faces that came straight from nature. No tricks needed when you had Paulina Porizkova, and not many needed when you have Natalie Portman, I imagine. 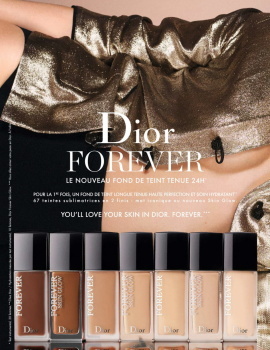 Eeeeew, that Dior Addict shot is horrible! So, is Cara taking Bella's spot? I've seen her doing interviews with Peter, which used to be what Bella did. Cara’s shot is just simply tragic, probably the worst she’s ever looked no thanks to the horrible retouching of the image. that Dior Marie Antoinette/macaron/pastel/unicorn make-up theme has been popularized on social media with all whimsy completely sucked out of and recycled a thousand times over. Sorry Peter, your're a bit late on that bandwagon by like 6 years. And if I see another robin's egg blue background a la Glossier via '90s McDean/Sims tumblr posts I'm gonna hurl. It's weird because I buy a lot of makeup and beauty products but I've never bought any Dior products except for perfumes. Their makeup products don't look as desirable and luxurious as Gerlain or Chanel in ads for some reason. And it's not Bella or Cara who are going to make me change my mind. i wish richard burbridge shot more beauty campaigns. always so striking and spot on! Wasn't Cara the face of YSL beauty for years? If its to replace Bella, I would have chosen someone else. I only like mascaras from dior makeup line, and they discountinued my only favorite mascara. She was the face of YSL and Rimmel London. I mean, I get that she's famous but...she can't sell make-up. I guess Cara will be doing campaigns for products, like Bella does. But they never get the main campaign. They are using Cara like the new Kate Moss. Every brand wants to use her. It was like that with Kate Moss and Gisele Bunchen in millenial era in 2000s. Every magazine all brands had just Kate and Giselle in every ad. But then it does not make them unique. Its more ordinary to see them in every single ad. Cara is becoming like that. I know thats the thing with supermodels. They are everywhere. But brands have many options. They can use many new upcoming hype faces. 333101 and MyNameIs like this.